The dam boat ramp at Smith Reservoir is an easy entrance and gives quick access to the deep cold waters of Smith Reservoir. 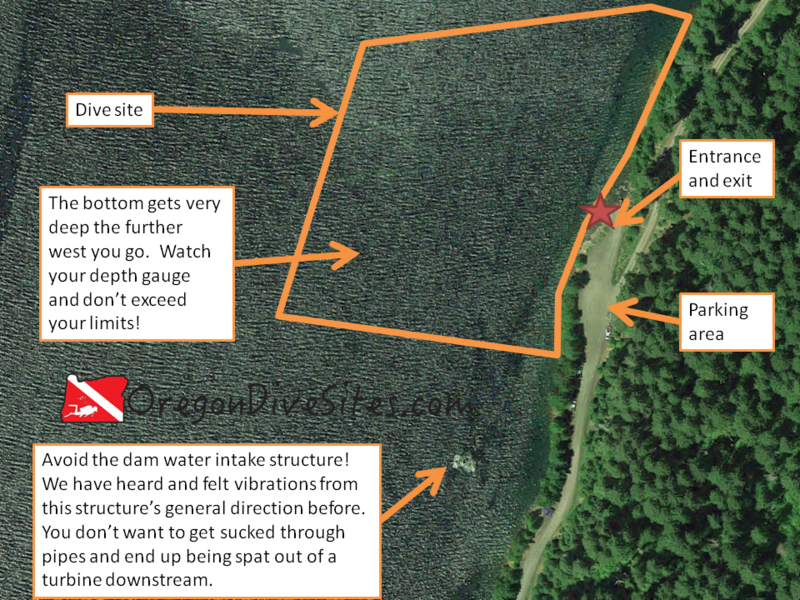 However, the water intake structure for the Eugene Water and Electric Board is nearby and divers should use caution to not go near it. The water is deep and cold enough here to make a regulator free flow as well due to ice buildup. Diving at the dam boat ramp at Smith Reservoir allows you to go deep in a hurry where low light and cold water make the diving a little more challenging. Huge old stumps from when there used to be an old growth forest here are a highlight. The reasons for people diving at the dam boat ramp on Smith Reservoir are mainly because the entrance is easy, you can go deep quickly, and there are big old stumps underwater to check out. This is a typical Oregon Cascades lake or reservoir dive site with very cold water at depth, low viz if you stir up the bottom, and isolation from other humans. There are no nearby towns. Eugene, Bend, and Salem are equally far away. There is a lodge at Clear Lake with a few basic services. There is ample parking around the boat ramp but be sure to leave the ramp itself and the boat trailer parking clear for people with boats. The last time we were here, we did not have to pay to park although this may change in the future. The farther west you go, the deeper it gets until you exceed maximum recreational dive limits. The water intake structure south of this dive site is to be avoided. This site is more or less aligned to the cardinal directions. The shore runs roughly north-south. Head east to find your exit. Head west to find very deep water. Be careful of going too far south. You want to avoid the water intake structure so you don’t end up sucked to an untimely death in the hydro electric project. The best part of this site is how easy the entrance and exit is. Just walk down the boat ramp and into the water! Easy! Do be mindful though of boater traffic and the occasional angler. This is a freshwater dive unless someone dumps a LOT of salt in the lake. This is a shore dive although you could practice your boat diving skills here. This site is usually pretty calm. It’s a good idea to have a dive flag since you’re near an active (although seldom used) boat ramp. We recommend a dive flag on our Gear We Use page that we have used all over Oregon and are very happy to have in our inventory. 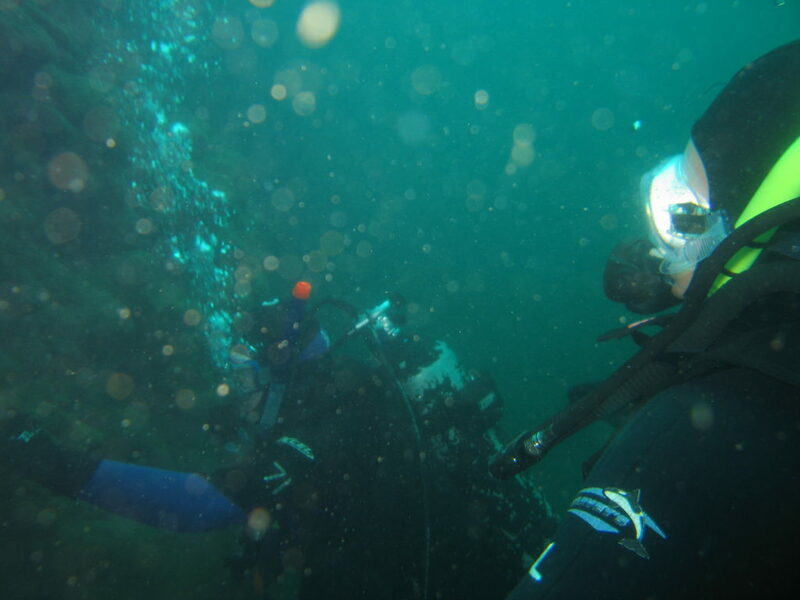 It can get really dark at depth at this dive site, especially if the sun is not directly overhead. A good dive light is a good idea. 15-20 feet of viz is the norm here although during spring snow melt or heavy rainstorms, the viz can be much lower. The bottom can be stirred up and lead to greatly reduced viz so practice good neutral buoyancy skills. At the surface it can easily hit 60F in the summer but at depth, the water can be 38F all year long and even colder when the snow is melting. We had a regulator free flow at the other dive site at Smith Reservoir a few years ago because the water was so cold. Summer and early fall are the best times to go diving here. In the winter and spring, snow makes this site usually inaccessible or miserably cold to dive. We have gone down to 100 feet here where we had a regulator free flow due to ice buildup. You can go MUCH deeper if you want to or if you aren’t careful about watching your gauges. This is an altitude dive site so you should have altitude diver training. Open water divers can successfully dive here as long as you have altitude training. The entrance and exit are easy and most of the diving is easy. However, because you can easily go way too deep if you aren’t paying attention, we rate this as an intermediate dive site. The most we have ever had to walk is 100 feet at this dive site. If you can’t walk very far to an entrance, you could setup your gear right at the water’s edge and have someone move your car back up the boat ramp to the parking area. This is an altitude dive site. Beware of the water intake structure close to the dam. The dam boat ramp is far enough away from the intake structure that you would have to either be very inattentive or actively try to get near it to be in danger but there is a danger that you could get sucked into it. The water at depth is very cold and can cause your regulator to free flow due to ice formation. We had it happen to us once at the other dive site on Smith Reservoir. There are no close shops to Smith Reservoir’s dam boat ramp. The closest shops are in Salem, Eugene, and Bend. There is limited food service at the lodge at Clear Lake. There is camping at Trail Bridge Reservoir’s campground and plenty of primitive camping in the forests. If you have a boat, there is a campground accessible only by boat or hiking at the north end of the lake. At Clear Lake there is a lodge that rents cabins.